Cathy Galvin grew up in Coventry, attending school close to the university campus. She says, "Most of us growing up in the city in the 1970s had parents who had come from elsewhere to work in the factories. This poem chosen is a tribute to them." Speaking about her Warwick module, 'The Practice of Poetry', Cathy said, "The module was transformative from the moment I stepped in to the first class. And I wonder: are the chairs still where we left them on our last day, in a circle in the woods, where we had written poetry in the rain? There’s a joy and safety in writing in an atmosphere of trust and expertise. It was and is a return home." Mary gone with another man. Taff descends on a sideways slant. Crucified from cathedral to car line. Taff’s feet. Flesh falling on stone. Fed to banks, guns, her Lord. 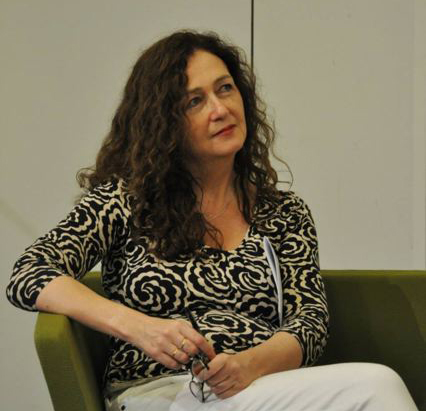 Cathy Galvin has worked on staff for Newsweek and The Sunday Times, where she founded the Sunday Times EFG Short Story Award. She is director and founder of the UK’s leading promoter of short fiction, The Word Factory. Her poetry has appeared in The London Magazine, The Morning Star and Letter To An Unknown Soldier (William Collins). Black and Blue, a sequence of sonnets, is published by The Melos Press. She edited Red, the Waterstones anthology of new writing and was consultant editor for Create, a journal of perspectives on the value of art and culture, published by Arts Council England.